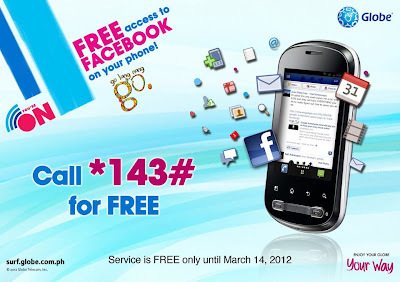 As a post-Valentine treat to all its loyal subscribers, Globe Telecom gives its prepaid and TM customers free access to Facebook via their mobile phones until March 14, 2012. Through m.facebook, the mobile version of www.facebook.com, Globe Prepaid and TM subscribers can browse Facebook on their handsets and easily post status and comments, add friends, upload and tag photos, and edit privacy settings wherever they are, without the need to log on to their laptops or PCs. Globe subscribers using any internet capable phone* can enjoy unlimited access to the world’s most favorite social networking site. With this exciting promo, everything will be a breeze for Facebook fanatics: post a status while braving the traffic, make a hilarious comment on a friend’s status, take a photo of that yummy dessert and then upload and tag your best buddy to get her envious, or change account settings to make sure profile is kept private. Capture all these special moments in an instant with the Free Facebook promo from Globe. To access Free Facebook, Globe Prepaid and TM subscribers need to register to the promo by texting FREE FB to 8888. Globe prepaid subs can also call *143# for free. Upon subscription to the promo, users will receive a confirmation message and a link to m.facebook.com. Another option is to go to the internet browser and type m.facebook.com. Service is free until March 14, 2012. Know more about Globe Mobile Internet by visiting www.surf.globe.com.ph or texting SURF to 8888 for free. Here in KSA, the network of STC (Saudi Telecommunications Company) has long offered the people (citizens and ex-pats alike) free browsing of FB in mobile with SIM using STC. And it can be access through www.0.facebook.com. The only difference of it from Globe is that it's not only for a limited span but for life. yehey! globe ako ! will try this! :) thanks for the info! thanks for this post! galing naman! Yeah, I hope they included postpaid. :) You're welcome!